GAME FEDERER - 2-3. Some very straightforward holds of serve since that epic second game. I am already getting the feeling we could be heading for another breaker. C'mon Andy bring it home for the Scots. Should have been over now, Federer serving for match and then 2 match points wasted. come on roger. That boy is amazing!! Come on Andy. One of the toughest players in recent years. I feel sick not to be watching it, stuck in work! I'm surprised how well Federer is playing, I thought he was past his best! Murray needs to believe in himself, he's a fighter. THINK POSITIVE ANDY! Into a fourth hour of this match now. It's already been a bit of a classic, potentially only halfway through! Used to get all the top sport on TV but that's changed now, such a shame as I really want to be watching this!!!! 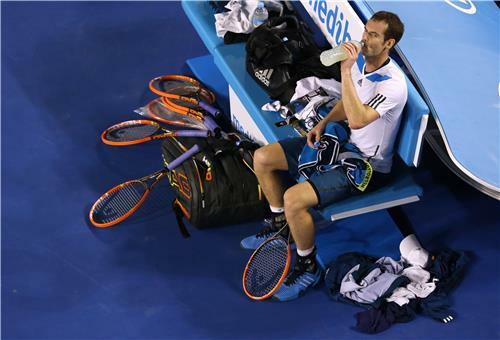 You can do this Andy!! You are now exactly neck and neck on the poll at the top of this page. 50:50, so hard to call. Who's your money on Tom, can you see any swing in body language between them? Tom your commentary is fab! all down now to who wants it the most! Haha, sorry! I suppose you have got to say Federer as he holds the lead and Murray is coming back from an injury. Both players are unhappy with the TV replay inside the court. Federer earlier at the "did it bounce twice" lob and now Murray as it shows him potentially showing signs of injury. If I am honest I thought Nadal was certainly the favourite for the title but if his blister doesn't clear up it could give him real problems. how can you be at work and watch tennis? 3-3. Another lengthy game but it feels incredibly short compared to game two! All that matters is that Murray holds and we remain on serve. I thought that Federer was past his best but my opinion has changed after watching this. Still believe that Murray can do it though! Come on Andy! Remarkable, over 2000 votes and it is exactly the same in terms of votes of who you think will win this match. So, so hard to call right now. I still fancy a fourth set tie-break. GAME FEDERER - 3-4. Murray loses his range on the lob and goes 40-0 behind. A small fightback to 40-30 doesn't bother R-Fed though who holds again. Come on Andy you can do it.Thanks for the great commentary Tom. I was supposed to go out an hour ago, keep up the great commentary Tom. Whatever happens Andy has has shown he is a true 'brave Heart!' C'mon Andy get intae Him !! Hold that thought, Federer 0-30 up on the Murray serve. Uh-oh. 0-40. Federer gees himself him. He senses blood here. GAME FEDERER, 3-5. Murray on the brink again. Federer goes long before Murray pings in a 126mph serve to get it back to 30-40. But a brilliant rally ends with a Federer drop shot that Murray can't quite get enough on.